I sit in a hotel room in a catatonic state – waiting for the phone to ring. They give me the details of The Job and I go to work, putting on a bland suit and tie, combing my hair with a side parting so that I’m able to blend into the crowd just like Mr. and Mrs. Joe Average. My suitcase bounces on the springs of the bed when I fill it with all the important tools I require to finish such a dangerous job. That’s not how it happens. There’s no hotel room, no suit – or suitcase, for that matter, because no special equipment is required to read a book. Except perhaps for a bookmark. The truth is, I’m just a sad little man with a blog. But there are a lot of those guys about in fiction who do sit about in hotel rooms waiting for The Call. You know the ones. They’re professionals. Sometime they read sandscrit for fun and drink a lot of coffee. They’re mysterious: they have no friends, they have no job, they don’t collect knick-knacks. They’re not like the heroes of old. They don’t wear gorgeous mullets and prance around on Harleys. They fly in under the radar. They want to look as average as you or I. Well, you, anyway. When the phone rings they go to work. The job is usually dangerous, but they’re absolutely the best at what they do. They use their instincts. They know their way around all sorts of high-velocity hardware. The latest mysterious guy on the block is Carter Blake. Not his real name, of course. Carter is the go-to guy for finding people who don’t want to be found. In Mason Cross’s hugely entertaining debut novel The Killing Season – published yesterday in hardback and on e-book – the FBI employ Blake to track down a deranged sniper who wants to take out a lot of people. They pay Carter a lot of money because he’s the best – and then they make the mistake of totally ignoring his advice. So there’s lots to admire in Cross’s thriller. The writing is assured and entertaining. Mr. Cross really knows his way around a set-piece, and they come thick and fast. The plotting is slick and pacey. As the FBI caravan zigzags from state to state in pursuit of Wardell, Cross manoeuvres his characters inexorably towards a satisfying fatal showdown. Sniper Caleb Wardell is the standout character. Of course he is: he’s batshit crazy. In fiction, we love snipers because they sit on roofs and they can out random people – him, her, that old lady. In real life, not so much. Of course Carter gets in Wardell’s way and the whole thing comes dangerously personal. And Cross further ups the ante by making Wardell an unwitting puppet in an even greater conspiracy. As a character, Carter is still finding his feet a bit, I think. He doesn’t have the acute moral vision of Jack Reacher, say, or the cool existential poise of Roger Hobbs’s Ghostman. Blake’s not a great one for funnies. He seems an amiable chap, and he certainly knows how to do his job. The ladies like him – naturallement. We know something has gone wrong in his past because he has these flashbacks, but he’s still a bit of a blank page. As the series progresses – and make no mistake about it, Carter is here to stay – it would be good to learn a bit more about what makes him tick. But in his debut novel, Mason Cross – I’m kind of thinking that’s not his real name – has really hit the ground running, there’s no doubt about that. The Killing Season delivers time and again with smart big-screen thrills. Many thanks to Orion for the review copy. 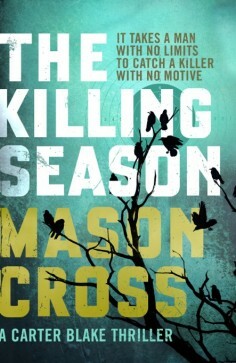 Next week, Cross gives us the Intel on The Killing Season and his path to publication, so look out for that. This entry was posted in Books, Reviews and tagged Carter Blake, Ghost Man, Jack Reacher, Mason Cross, Roger Hobbs, The Killing Season on April 25, 2014 by Crime Thriller Fella.